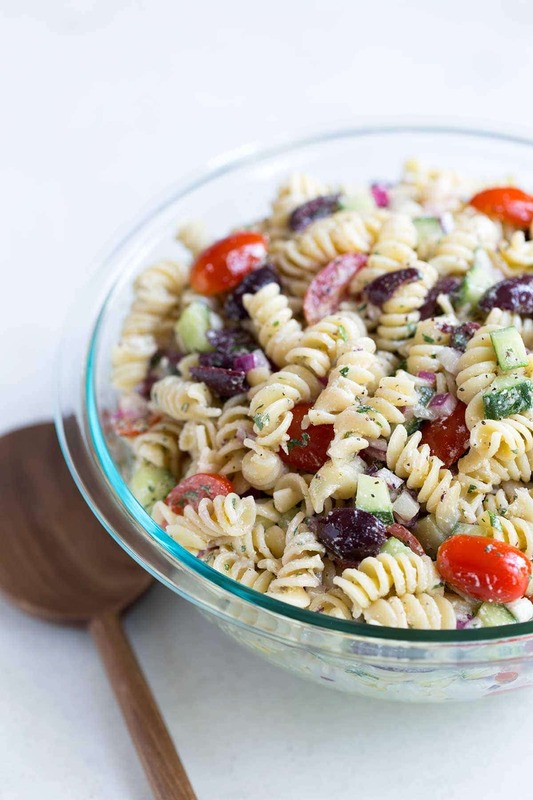 Greek Pasta salad is an easy, fast side dish that’s perfect for summer potlucks and barbecues! Salty Kalamata olives and feta cheese balance fresh, sweet tomatoes, while cucumbers add a crunchy texture. Skip the deli counter pasta salads, which are usually loaded with mayonnaise and lacking in flavor. 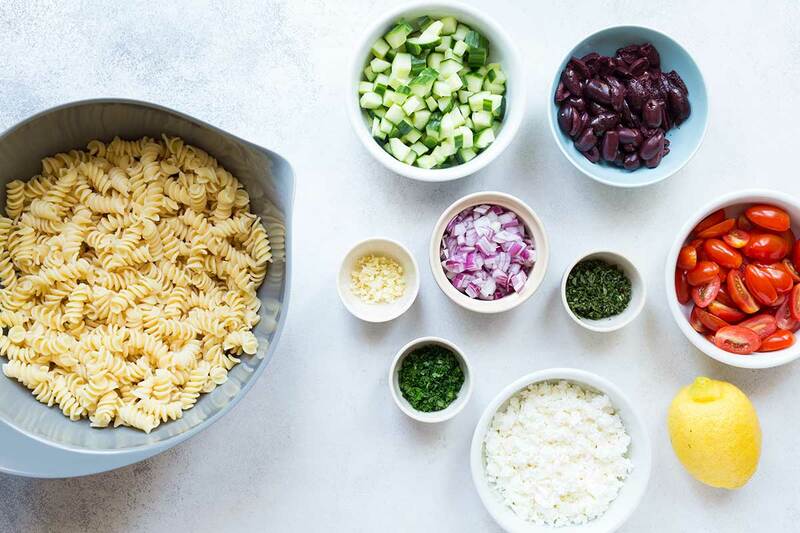 This greek pasta salad recipe will soon become a staple in your kitchen arsenal! Pasta salad isn’t usually something I gravitate toward, mainly because I associate it with the stuff sold at grocery store deli counters. In my opinion, those are often under-seasoned and swimming in mayo. Not the best. Preparing homemade pasta salad gives you control over each ingredient, ensuring that the pasta is al dente and the ingredients are fresh. You want be able to detect individual flavors and textures, which will muddle after salads sit in their dressing for a few days. 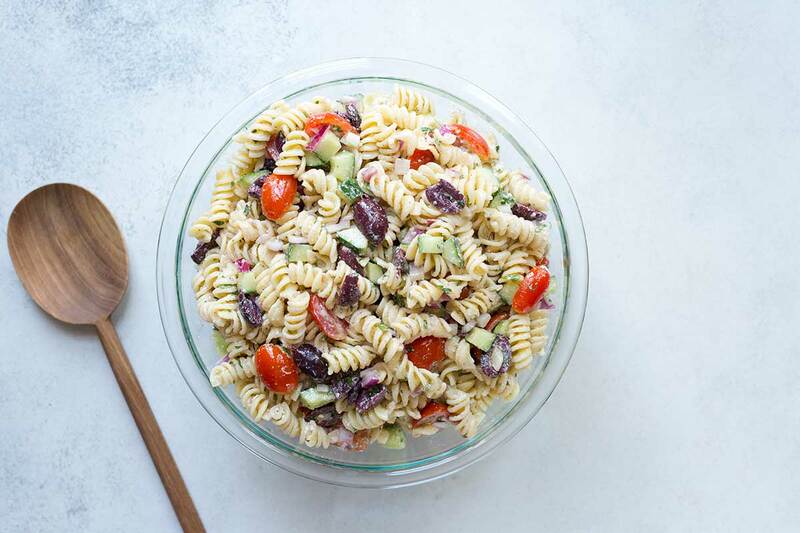 This greek pasta salad has such a great balance of flavors and textures. Tomatoes add just the right amount of sweetness. Kalamata olives and feta cheese add saltiness (the feta also adds creaminess). Cucumbers add crunch and just a hint of bitterness. The red onions and garlic add a spicy astringency, and lemon juice adds lightness and acidity. Pasta salad dressing doesn’t have to be heavy; I prefer it without any mayo at all. This version is more like the vinaigrette you’ll find on a typical greens salad. If you want a lighter side dish, this recipe would also work with salad greens such as baby spinach or arugula instead of pasta. I don’t find the red onion and garlic to be overpowering, but you can cut back on them if you prefer. I always flash back to the judge on Chopped who lost his mind when any of the contestants used raw red onions. While I prefer using fresh herbs (especially in the summer when my garden is up and running), you can substitute dried herbs. Always remember this ratio: 1 tablespoon fresh herbs = 1 teaspoon dried herbs. How Long Does Pasta Salad Last? Homemade pasta salad can be stored in an airtight container in the refrigerator for up to one week. However, because of the fresh vegetables, this pasta salad will taste best within the first 3 days. After that, the cucumbers will begin losing their crunch and the tomatoes will turn soft. In general, the flavors will become a bit more muddled. If you’re making this in advance for a party, I wouldn’t prepare it more than 1-2 days ahead of time. 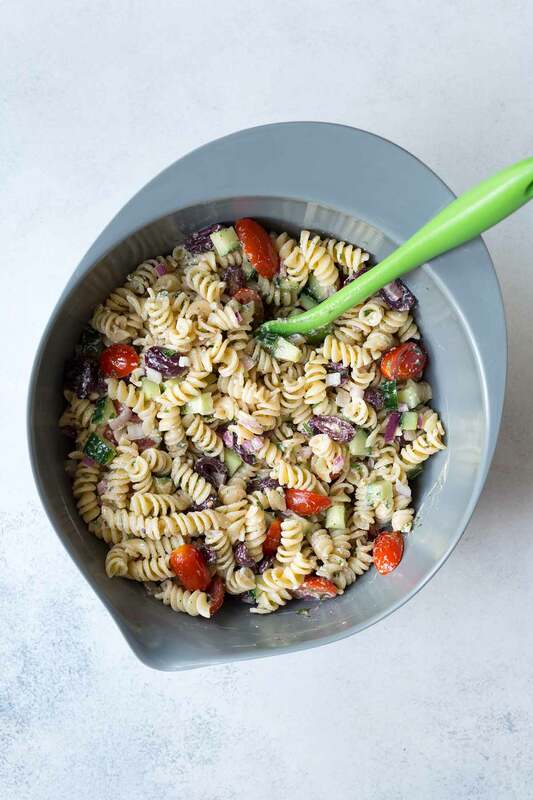 Pasta salads are associated with summer picnics and backyard BBQs for a reason. They pair wonderfully with grilled meats and vegetables. This greek pasta salad goes especially well with grilled chicken! 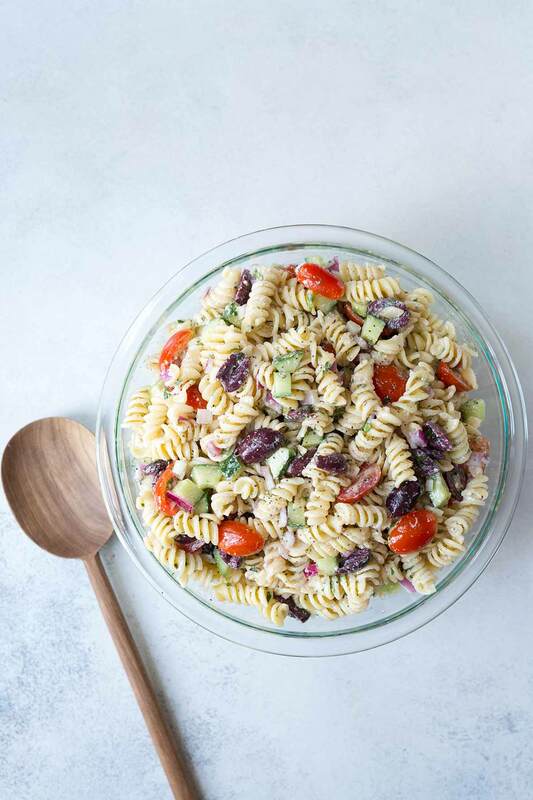 If you’re looking for other Mediterranean-inspired recipes to serve alongside this pasta salad, my hummus is an easy dip that comes together in no time. My Mediterranean Salad with Roasted Tomato Vinaigrette is also a nice option. Or how about one of my favorite desserts, baklava? This baklava from Simply Recipes looks amazing. Looking For More Easy Side Dishes? Check out my Guacamole, Twice-Baked Potatoes, and Summer Ale Beer Bread! 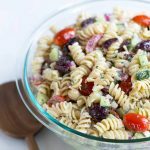 Greek Pasta salad is a fast and easy side dish that’s perfect for summer barbecues and potlucks! Salty feta cheese and Kalamata olives balance sweet tomatoes, while cucumbers add a crunchy texture. Bring a large pot of salted water to a rolling boil. Add the pasta and cook according to package instructions. Remove from heat, drain and rinse. Set aside. In a medium bowl or large liquid measuring cup, whisk together the olive oil, lemon juice, vinegar, garlic, oregano, parsley, salt and pepper. 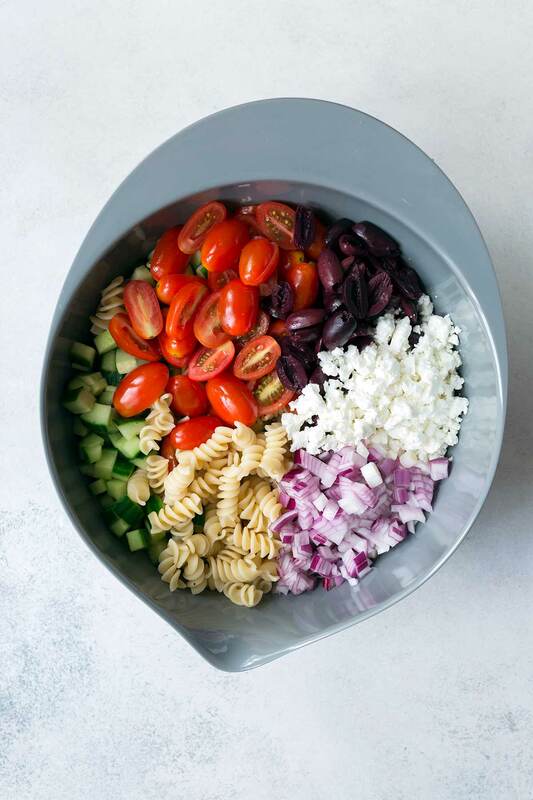 In a large bowl, combine the pasta, cucumbers, tomatoes, onions, olives, feta, and dressing, gently tossing to combine. Taste; add more salt and pepper if desired. Store leftovers in an airtight container in the refrigerator for up to one week. If possible, I recommend buy a block of feta cheese packed in brine and then crumbling it by hand. I think the flavor is so much better! However, the recipe will still work with pre-crumbled cheese. 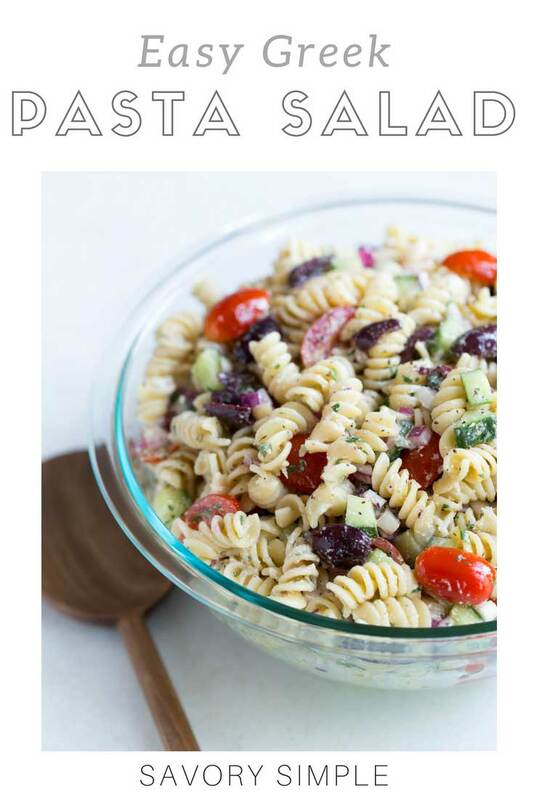 What a great post for a pasta salad! Love all the tips and descriptions. Can’t wait to make this all summer long! I can’t wait to make this all summer long! I love salads like this for summer picnics and bbqs! Yes! Skip the mayo and make it is light and fresh like this. Such great flavors! I make something similar! Love all the fresh Greek flavors in here! Every summer get-together needs this! I made this for a potluck last week, and my husband is requesting I make it again for him. Huge hit!